We at The AEGEEan were happy to interview this inspiring girl and tried to find out how Marina made the impossible possible. The AEGEEan: Congratulations! You are Member of the Month of February! How does it feel? Why do you think you were nominated? Marina: First of all, thank you to those who nominated me [she smiles, ed.]. I feel I might have attention now, and I am not a big fan of attention. I think it is pretty obvious it happened because of EPM Zagreb. Tell us more about Marina Klanjcic! What do you do? What do you dream about? How do you see yourself in 5 years? I was born 26-years-ago and my parents never knew what to do with such an active child. After changing many sports and activities during kindergarten, in 1999 I started dancing in a dance studio and I kept going as it became my passion. During high school, I was intensively learning Spanish, I fell in love with architecture, I was doing some IT stuff in a school “nerd” group (that is how they called us) and I started to take lessons and play drums with one of the best Croatian drummers. Back then, my dream was to become an architect, to dance and live in Spain. When I did not get into the Faculty of Architecture (only 120 students per year), my dream fell apart so I learned it is not good to have dreams, but goals instead. 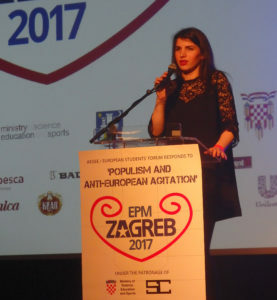 Now, I am finally finishing my Master’s degree in Information and Communication Technology at University of Zagreb, I am still dancing (although I took a break during EPM organisation) and I just applied for Erasmus in order to do my thesis in Madrid this winter. Also, I am the president of AEGEE-Zagreb and we are about to make some great changes with awesome projects. 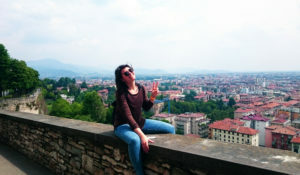 I do not think about long distant future anymore, I see myself now and I am happy with where I am and what is happening to me, so I will just continue doing what I am doing and enjoy life. 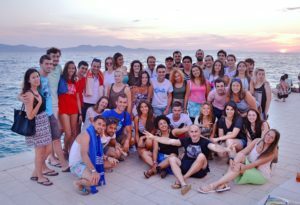 What’s your AEGEE story and how come that you are the main organiser of EPM Zagreb? 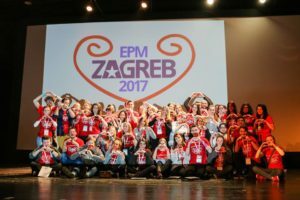 Describe us your typical day (of the main organiser of EPM Zagreb): what were you doing exactly? And for now – are there any responsibilities left? I was either on my laptop, my phone or at a meeting. I was coordinating the whole organisation and the tiniest aspect of it. It was intense, but that is what happens when you want to have everything under control and you want it to be perfect. I still have responsibilities and things to do: we are writing a report for our partners and the financial report for the institutions. Apart from that, we are also editing the photos and the video that will be out soon! If you were a fairy, what would you wish yourself during those days of EPM Zagreb? I would wish to teleport (whenever wherever), definitely. And also, to have a clone, that would have been useful! What have you learned? Was it a life-changing experience? 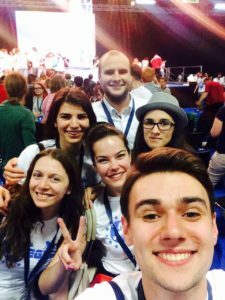 I have learned too many things not to fit in one article, but one thing I have to mention is that amazing teamwork is not just a theory, it really is possible and it exists, especially in AEGEE-Zagreb. Thank you to my whole AEGEE-Zagreb team again and to all the helpers! If someone had told me 3 years ago that I would organise a conference for 250 students, I would have said: “Over my dead body”. It is a life-changing experience for me because, no matter how strong I felt before it, I realised how much stronger I can be and how much of the capacity I have I am not actively using. Now, I really feel I can “move mountains” and I am so going for it. Any advice for future EPM organisers? 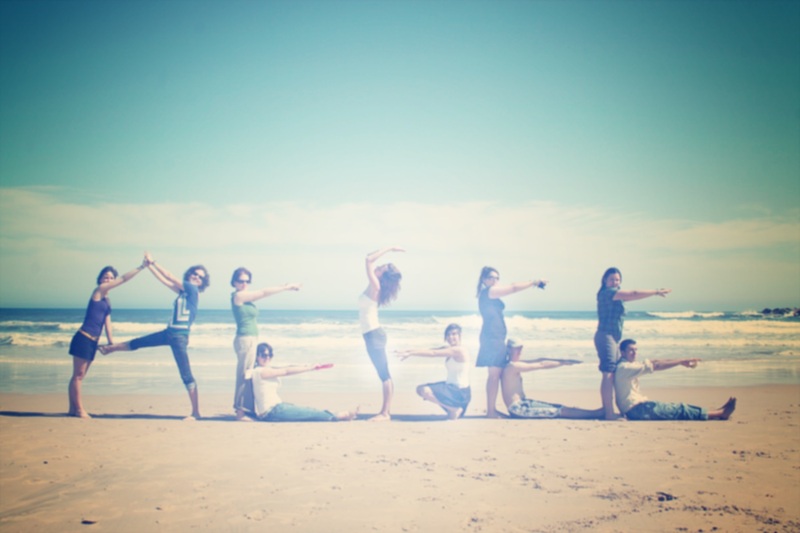 Do not forget to have fun while doing it!